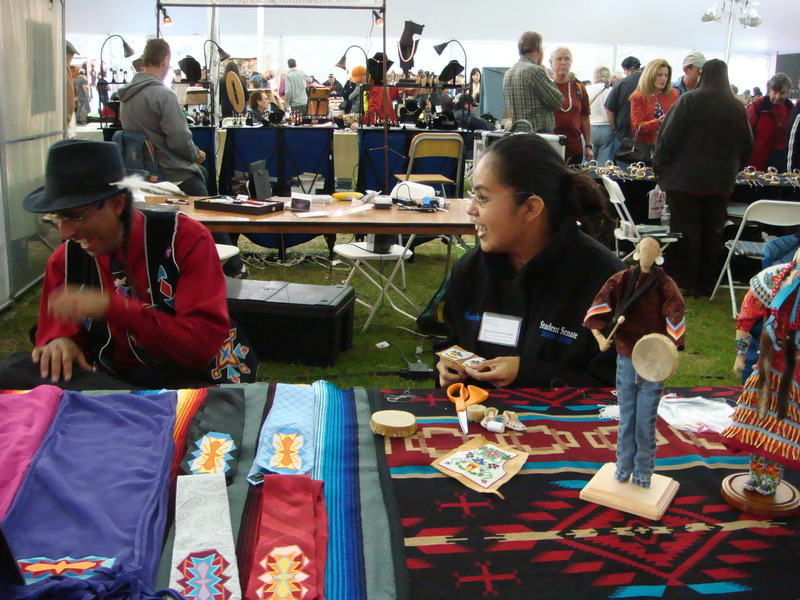 American Indian Arts Marketplace at the Autry | how's it going, eh? 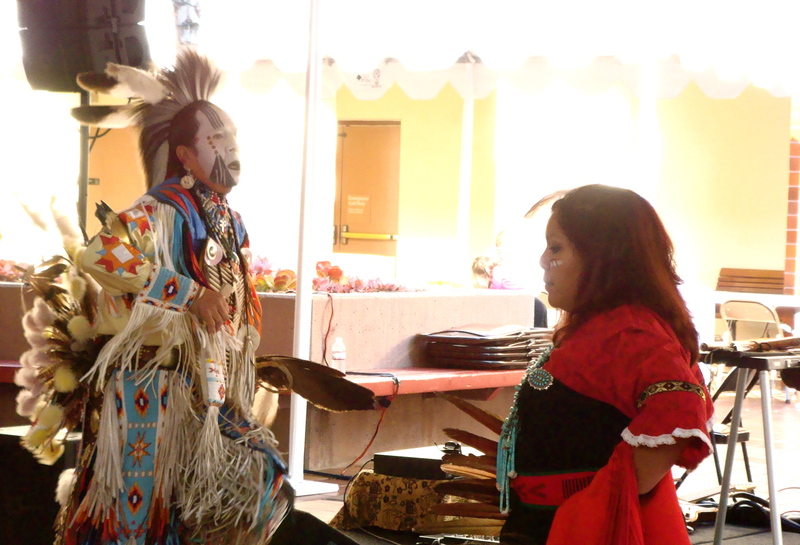 Saturday was the much anticipated American Indian Arts Marketplace at the Gene Autry museum. It is one of my favorite events of the year + usually happens in the fall. Debbie + her mom Naomi were my dates! 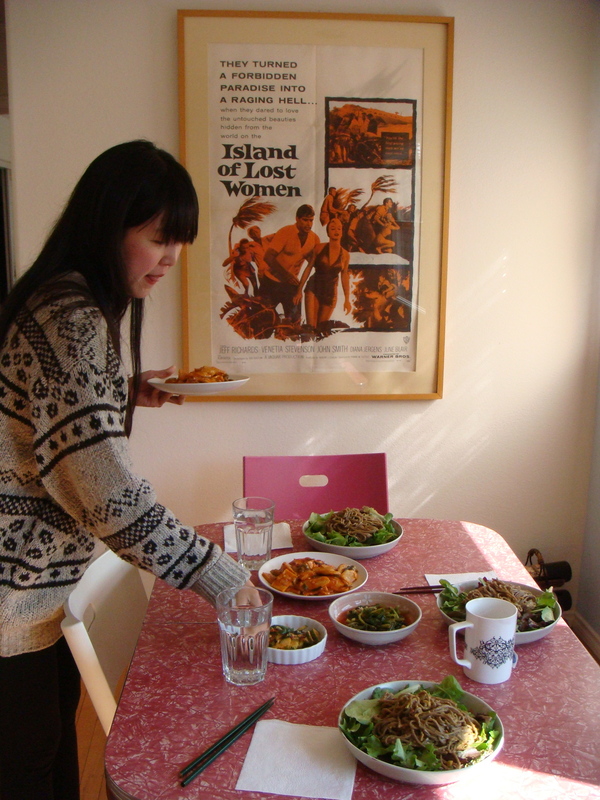 Naomi is visiting Debbie from New York, + before the Marketplace, I went to Debbie’s house for lunch. I love when Naomi visits because she always makes yummy, healthy + fresh Korean food!!!! For all of you that think Korean food is all bulgogi + meat – you’re wrong!!!!! Naomi uses lots of greens + everything tastes so light!!!! Lunch was buckwheat noodles on a bed of spring greens, cucumber kimchi, daikon leaf kimchi + spicy rice cake. YUUUUUUUUUUM!!!!!!! Thanks Naomi! My compliments to the chef!!!! I was so excited when we arrived at the Gene Autry that I started hyper ventilating! I’ve been waiting a whole year for this!!!! I put on so much turquoise, y’all!!! 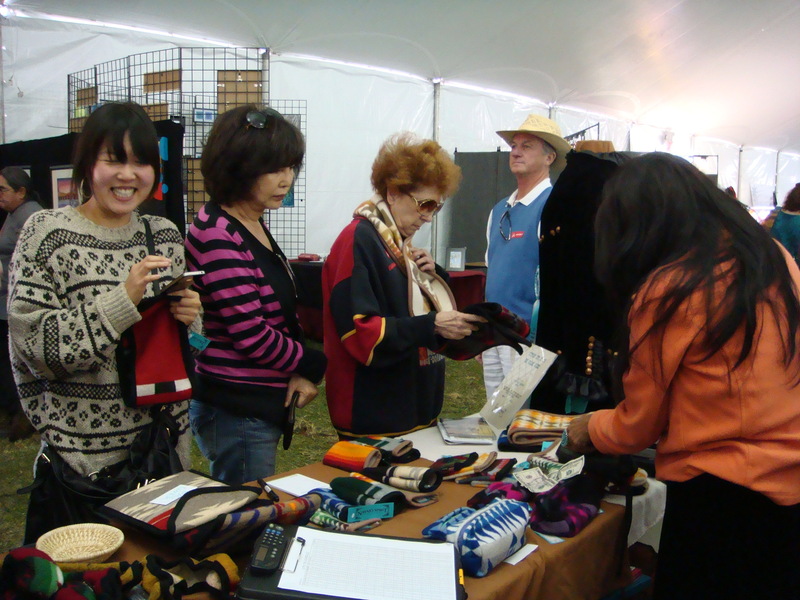 Inside the tent there are vendors selling everything from turquoise, art, photography, clothing, etc. 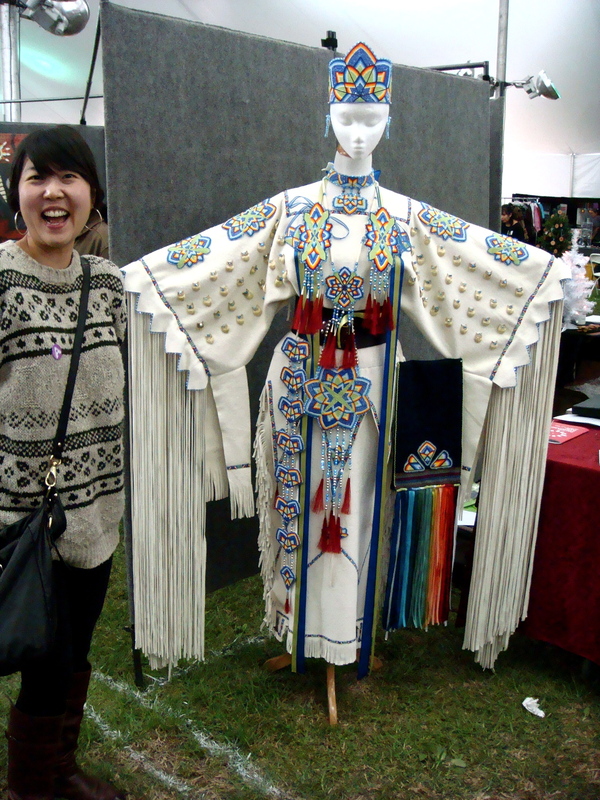 Here’s Debbie in front of a beautiful beaded pow wow costume. Even though we had a big lunch, guess who was hungry again?! I had to get some frybread while I was at the Marketplace! 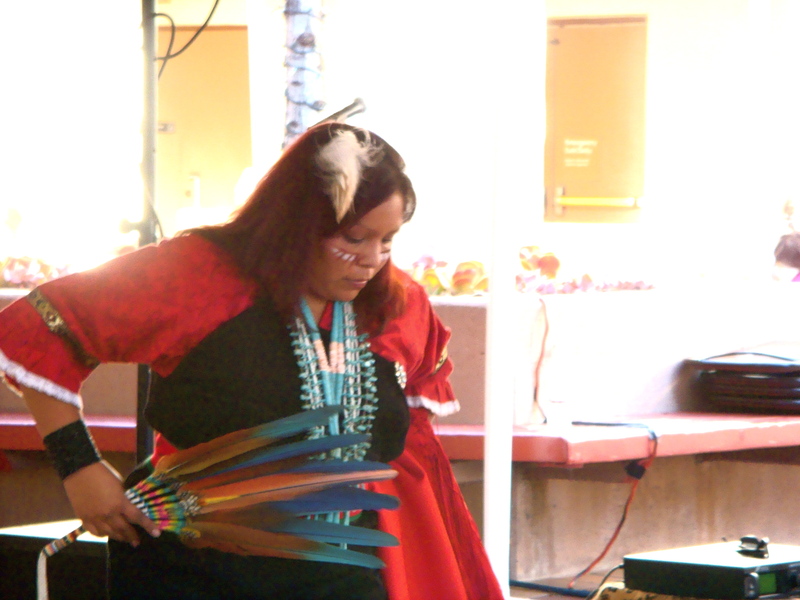 It’s a sin to leave the Marketplace without having frybread! There were three food trucks outside, because food trucks are really trendy right now. 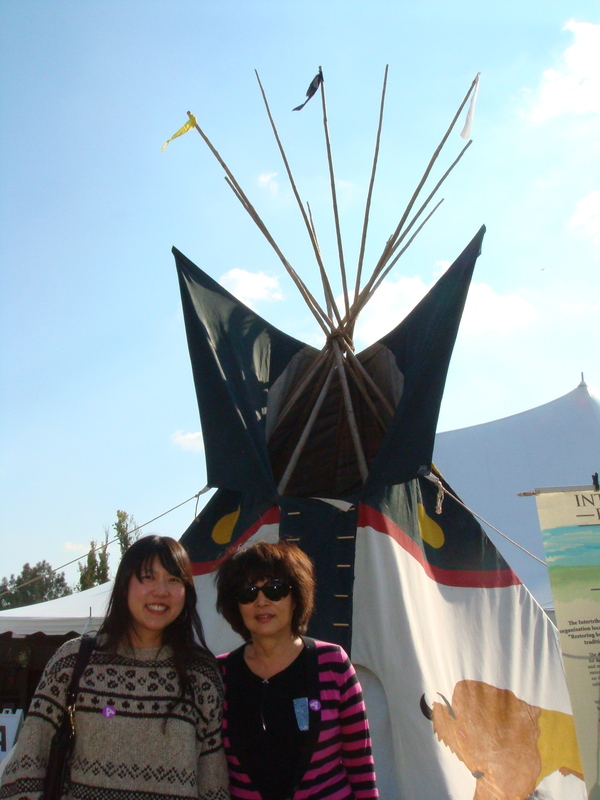 I remember when they served the frybread from under a cramped pop-up tent. When I was placing my order + gave the girl my name, this guy behind me said, “Shelli? Shelli Morningsun?”. I was like, “Excuse me?”. 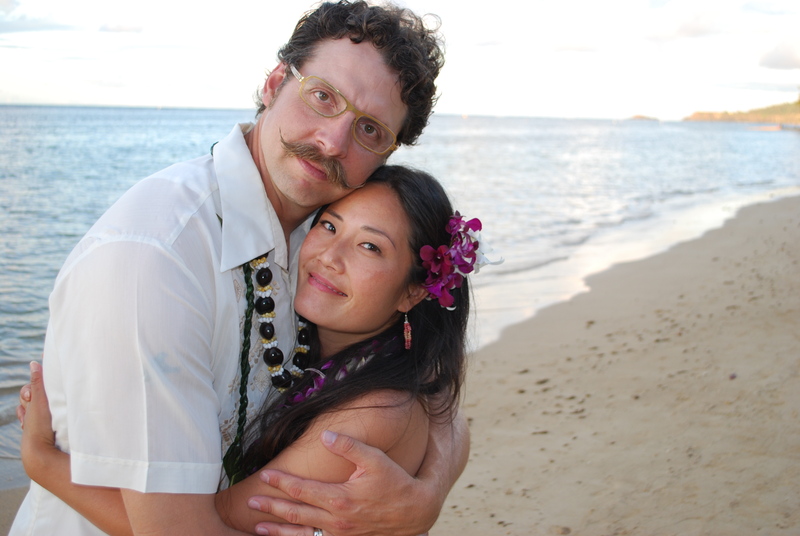 He replied, “Is your name Shelli Morningsun?”. I was like, “No.”. He apologized + said, “Oh, I thought you were Shelli Morningsun. She’s a really amazing vocalist + she’s performing on stage later today.”. That was pretty funny. Somebody at work the other day asked if I was American Indian. I think all the turquoise plays mind games on people. Check out this frybread!!! 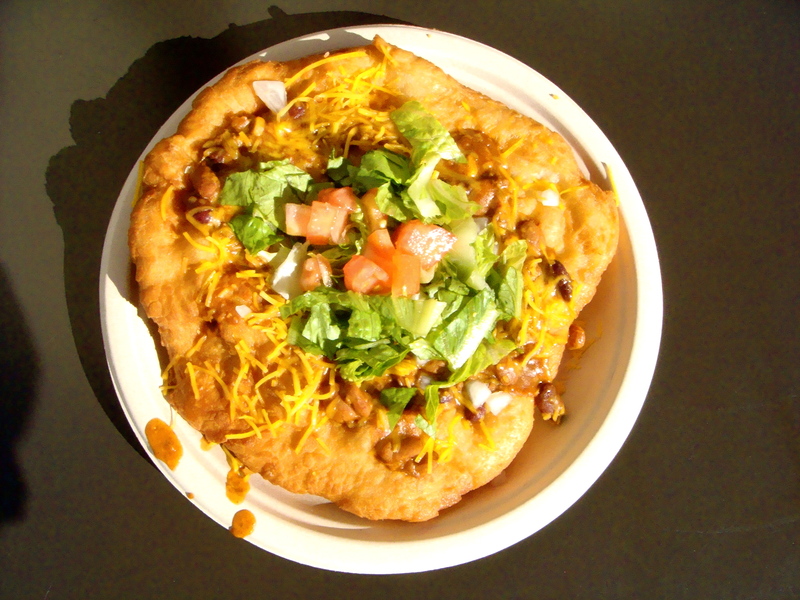 Frybread is like a Native American taco. Fried, doughy goodness with chili ground beef, cheese, lettuce, tomato!!! And since I was with a couple of Koreans, we doused it with so much Tapatio hot sauce, it was a fiery mess!!!! More salsa! Oh, I will be sad in Canada without salsa on every table…. 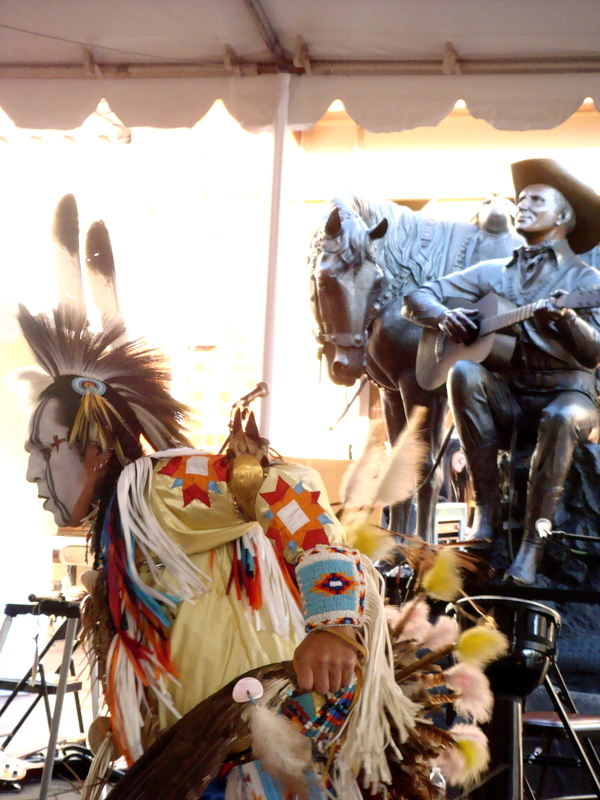 This was my favorite thing at the pow wow! 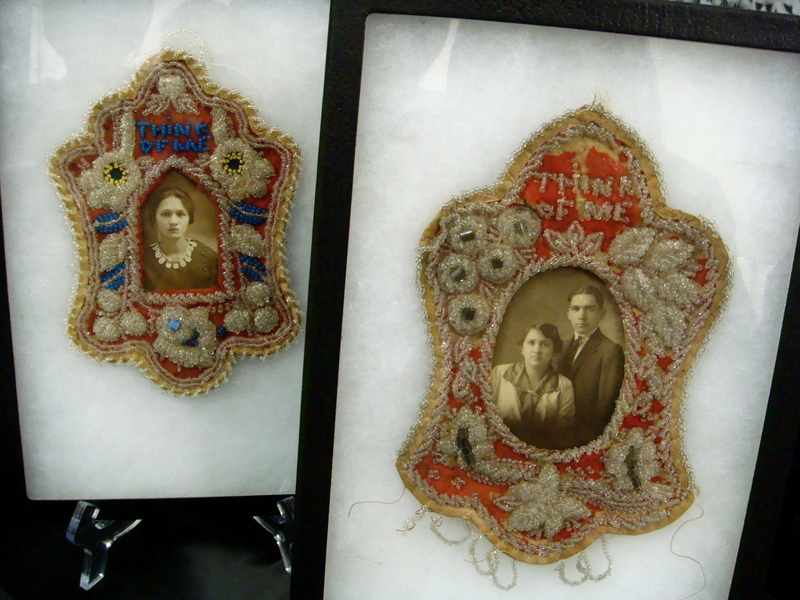 These were raised beadwork souvenirs from Niagara Falls made during the Victorian era by women of the Tuscarora Nation. The guy was really excited when I told him Jeff’s aunt lives in Niagara-on-the-Lake. Isn’t it gorgeous + amazing!? I really want one. 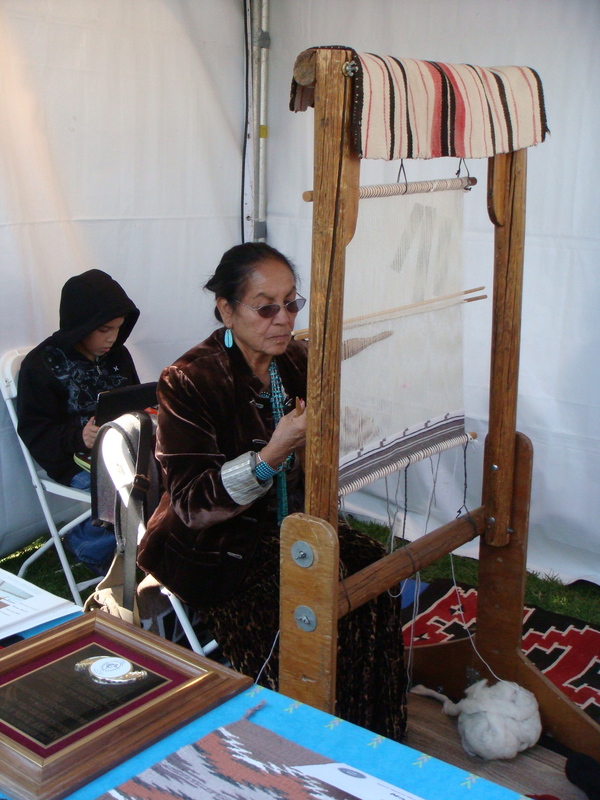 The technique is called a “hump stitch” or “rope stitch”. 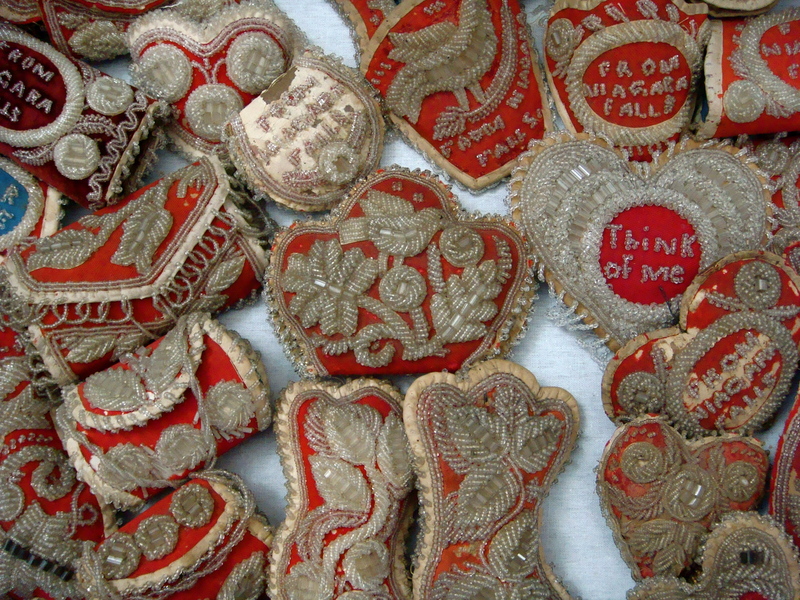 This creates the three dimensional shapes by sewing beads in raised arches or by sewing beads over beads. Drool. 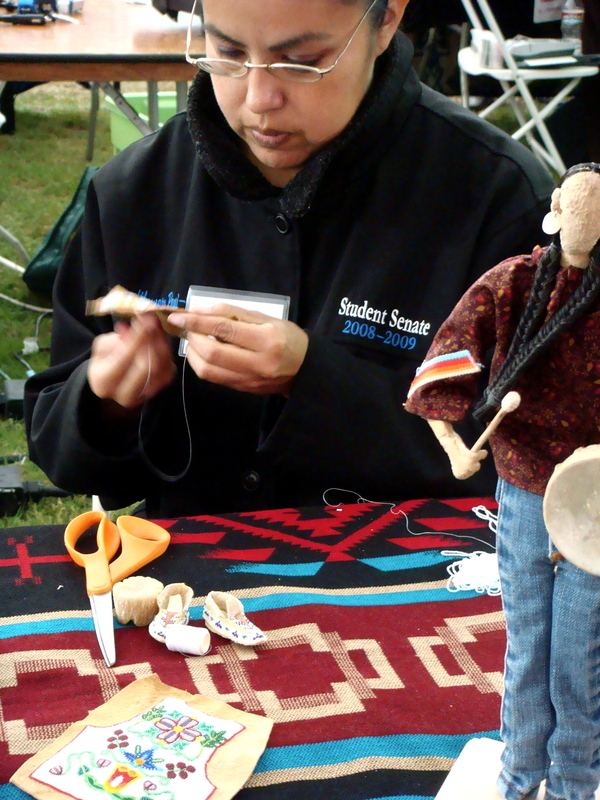 This gal was making these ridiculously awesome dolls + was in the process of beading moccasins + a vest for the male doll. Me want these too!!!!!!!! Debbie + I were obsessed with these scarves that you’ll see us wearing at the end of the post. We were making such a big deal about them that the lady in the red + black jacket next to Debbie’s mom had to get in on the action. They’re so cozy – we love them!!! 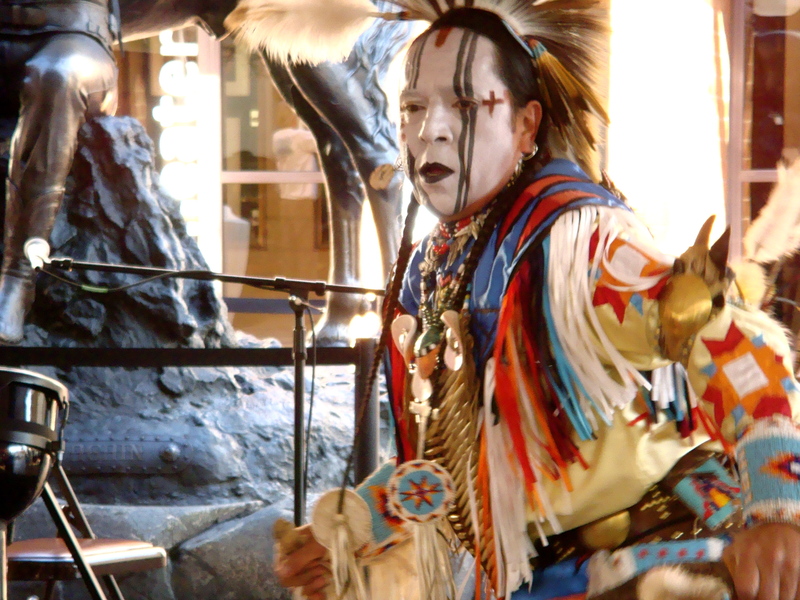 We ended our day by watching the dancers perform. 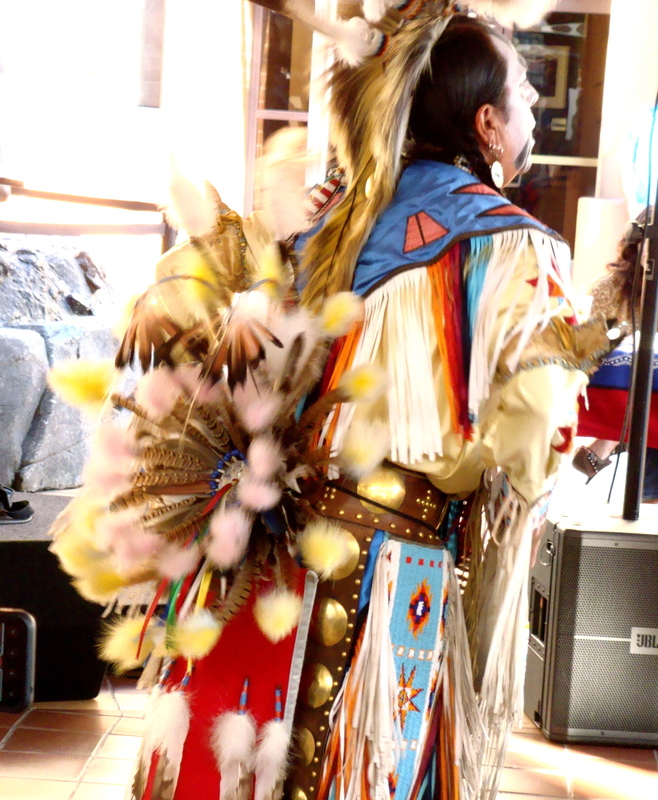 Look at their beautiful costumes, beads + turquoise!!! Double drool!!!! What a fun day! I did not purchase any turquoise! My restraint was world class!!! 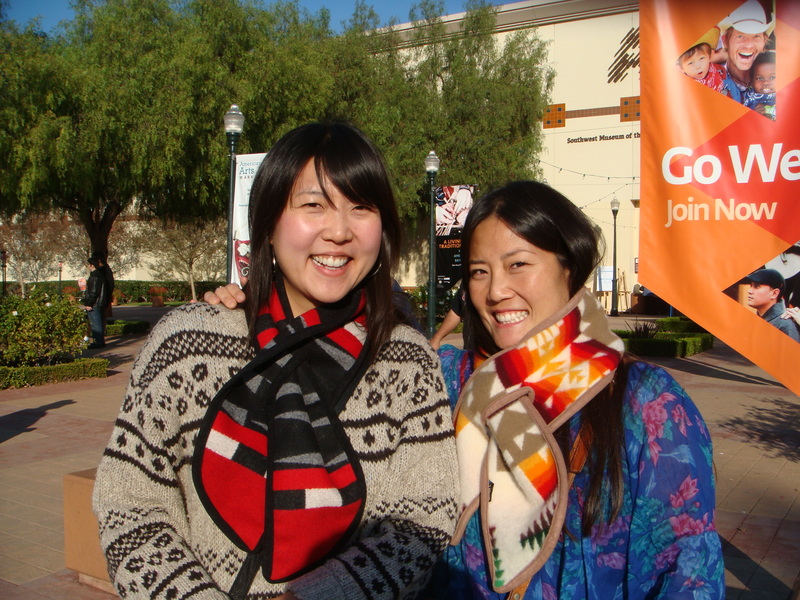 Here’s Debbie + I in our beloved scarves. They are warm as heck. I am so glad you, Debbie and her mom had great day. I want to see those beautiful scarfs. 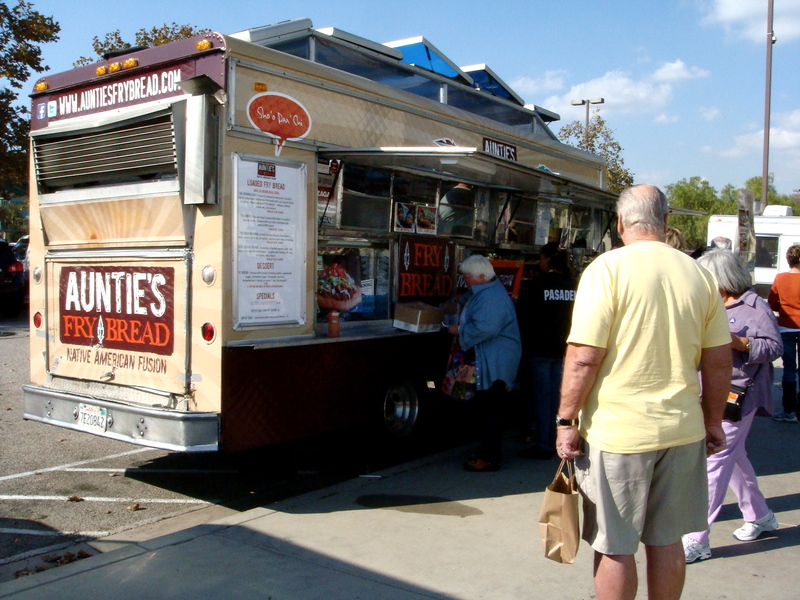 next year,…the flat-bread taco looked so sumptuous, i want one,…ha ha…LOL !!!! Merry Christmas 2011!!! | how's it going, eh? Debbie in the Country | how's it going, eh?